GOVERNMENT is taking another look at the possible establish­ment of a hydro-power scheme at Tiger Hill, up the Demerara river, as it seeks to push the development of alternative sources of energy. “We are looking at primarily the cost,” head of the Guyana Natural Resources Agency (GNRA), Mr. Winston King told reporters on the GBC ‘Face the Nation’ programme. The Eclipse hydro-power project in the Northwest has been discontinued because it “ran into some kind of financial difficulties” King said. The fresh look at the Tiger Hill scheme is part of an on-going review of hydro-power development and King said the focus has shifted more to mini or micro projects in more remote areas of the country. Tiger Hill was first mooted by the government of the Peoples Progressive Party (PPP) in the early 60s but was shelved by the Peoples National Congress (PNC) administration in favour of the ambitious multi-million-dollar scheme in the Upper Mazaruni later abandoned when government could not raise the finance for its construction. “Finance will always be a problem. We don’t know where we will get it from. If we had it we would do a large hydro-power project now,” King said. Financing for the mini and micro projects is about 12 – 4M (US) each and GNRA is currently identifying the siting of those. One project identified for Moco Moco in the Takutu has been esti­mated to cost under $2M, King said. THE shoemaking industry in Guyana is on the decline and several crafts­men in the busi­ness say they’ll soon have to find new ways of making a living if the quality and supply of mat­erials do not im­prove in a hurry. Many say they have been forced to resort to shoe repairs only, and even this poses a serious threat to their survival, as prices for the basics skyrocket each week. Sam Whittaker and his nephew Keith Barnes are examples of this dilemma. 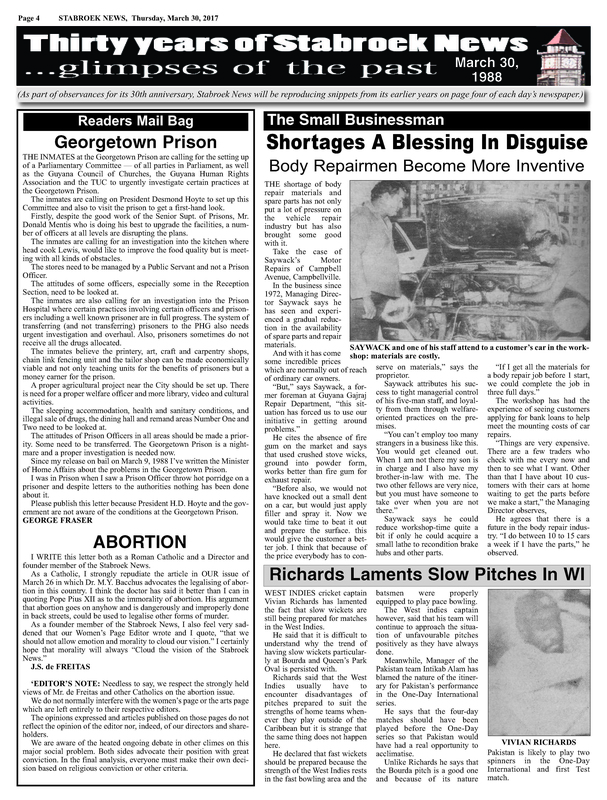 They have been in the busi­ness for more than a decade Sam 17 years alone in the Stabroek Market. 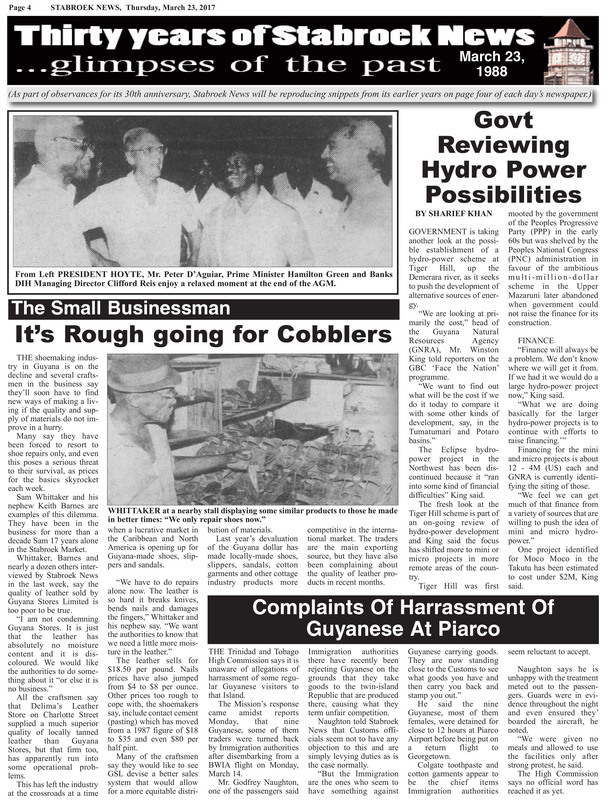 Whittaker, Barnes and nearly a dozen others interviewed by Stabroek News in the last week, say the quality of leather sold by Guy­ana Stores Limited is too poor to be true. 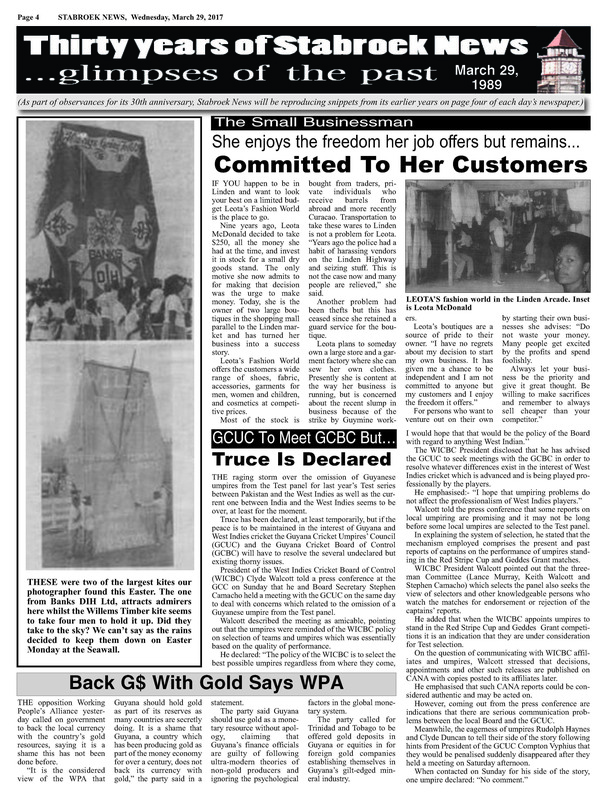 All the craftsmen say that Delima’s Leather Store on Charlotte Street supplied a much superior quality of lo­cally tanned leather than Guyana Stores, but that firm too, has ap­parently run into some operational problems. This has left the in­dustry at the cross­roads at a time when a lucrative market in the Caribbean and North America is open­ing up for Guyana-made shoes, slippers and sandals. The leather sells for $18.50 per pound. Nails prices have also jumped from $4 to $8 per ounce. Other prices too rough to cope with, the shoe­makers say, include contact cement (past­ing) which has moved from a 1987 figure of $18 to $35 and even $80 per half pint. Many of the crafts­men say they would like to see GSL de­vise a better sales sys­tem that would allow for a more equitable distribution of mater­ials. 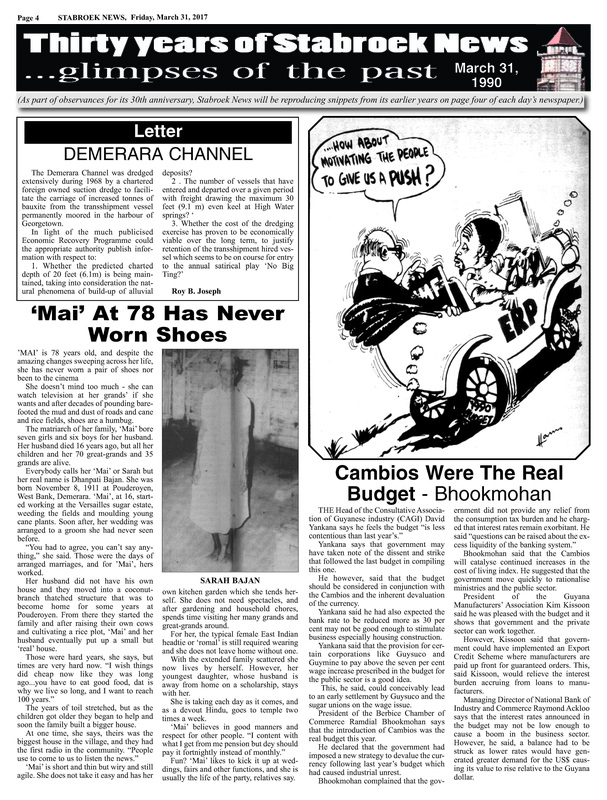 Last year’s devalua­tion of the Guyana dol­lar has made locally-made shoes, slippers, sandals, cotton gar­ments and other cot­tage industry products more competitive in the international market. The traders are the main exporting source, but they have also been complaining about the quality of leather pro­ducts in recent months. THE Trinidad and Tobago High Com­mission says it is un­aware of allegations of harrassment of some regular Guy­anese visitors to that Island. The Mission’s res­ponse came amidst reports Monday, that nine Guyanese, some of them traders were turned back by Immigration authori­ties after disembarking from a BWIA flight on Monday, March 14. 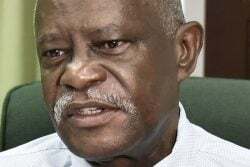 Mr. Godfrey Naugh­ton, one of the passen­gers said Immigration authorities there have recently been rejecting Guyanese on the grounds that they take goods to the twin-island Republic that are pro­duced there, causing what they term un­fair competition. Naughton told Stabroek News that Cus­toms officials seem not to have any objection to this and are simply levying duties as is the case normally. He said the nine Guyanese, most of them females, were detained for close to 12 hours at Piarco Airport before being put on a return flight to Georgetown. Colgate toothpaste and cotton garments appear to be the chief items Immigration authorities seem reluc­tant to accept. Naughton says he is unhappy with the treat­ment meted out to the passengers. Guards were in evidence throughout the night and even ensured they’ boarded the aircraft, he noted. “We were given no meals and allowed to use the facilities only after strong protest, he said. The High Commission says no official word has reached it as yet.